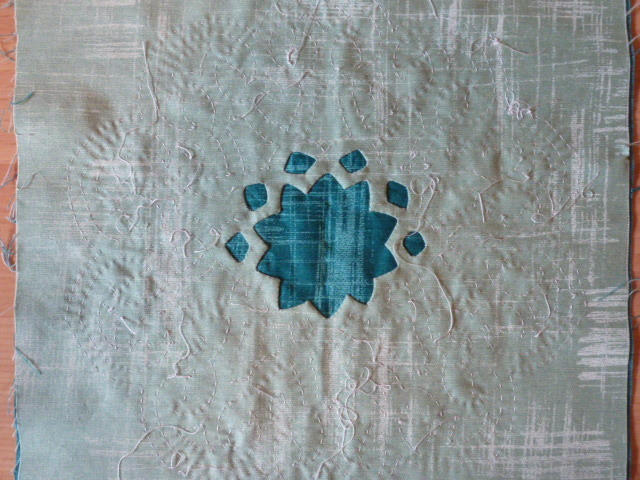 I’m reverse appliqueing a centre medallion for the applique that I showed you a few days ago. I’m using the Magnolia Lane Painter’s Canvas. 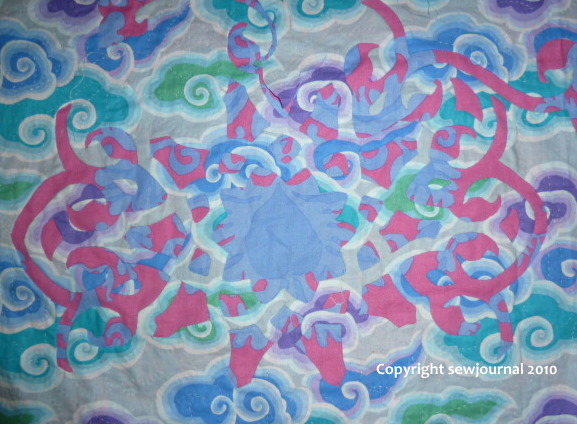 The design is an Arabesque and I used my Trace ‘n’ Baste method to transfer the design to the fabric. I was thinking that if I ever do some Hawaiian applique I might use this technique. What sewing did I get done this weekend? 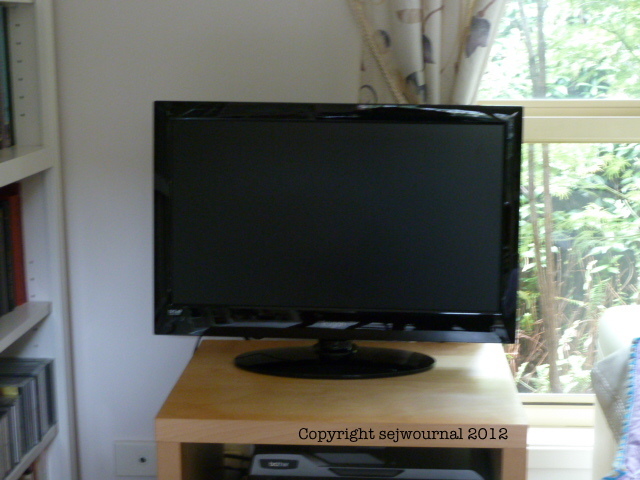 Well first of all I did something secret that I can’t show you because it’s a surprise for someone who reads my blog. I’ll show you once I’ve given it to them. The second thing is that I’ve been re-attaching the binding to my Arabesque. It’s been a tad tricky because I want the other part of the pattern to show so I’m having to applique the folded edge to the front – which makes it a little more difficult when it comes to creating the mitred corners – and then I will have to fold it over to the back and hand sew that too. However, I think it will be worth it. Here’s where I’m at with it at the moment. The second photo shows what it will be like when it’s folded over. What do you think? 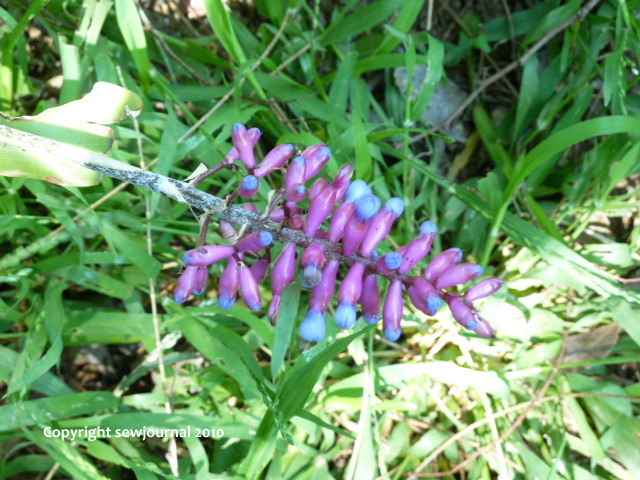 What do you think of these strange flowers? 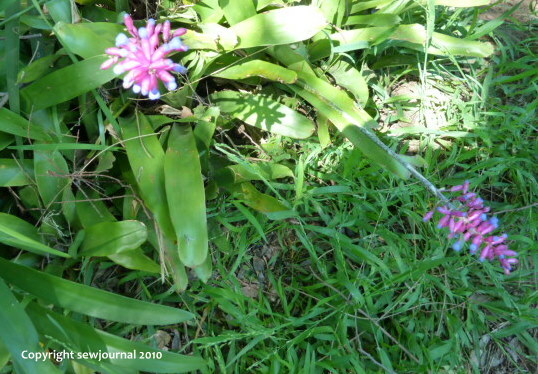 They’re some sort of Bromeliad and I love the colours. They grow in the shady spots in my garden and brighten them up. Remember the Arabesque? Well, I just knew I wasn’t going to leave it the way it was. Not after I spent so much time on it. I just couldn’t face unpicking it straight away though so I let it lie awhile. Anyway, on Thursday I took it to sit and sew and sat and un-sewed. It took me a good two and a half hours to unpick that binding. 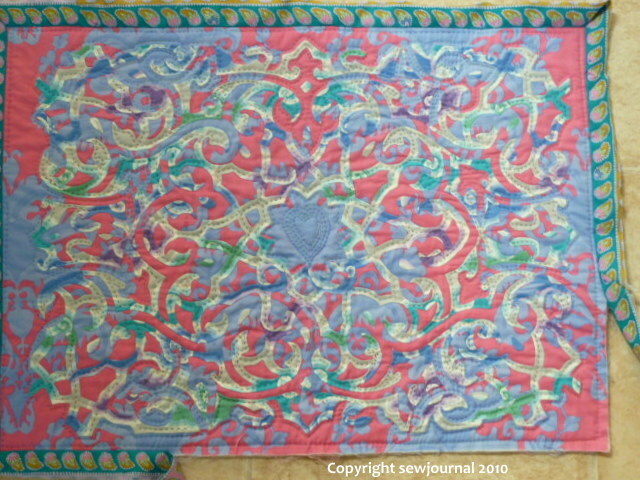 Then I pinned it carefully and added some more quilting around the outer arabesque and then quilted a 1/4″ or so in from the sewing the line. I have undone the binding where I attached the two bits incorrectly and now I just need to cut some of the fabric to see if I can get a match then I will be ready to re-bind. I’m not sure if I’ll do it by machine or hand. I guess it will depend on how I feel on the day. Wish me luck! Yesterday I bound the Arabesque. Working out the way to use the pattern and how to cut the stripes nearly did my head in. In the interests of the Process Pledge I’ll tell you I made a mistake which I didn’t see until the very end. I thought about undoing the whole thing and starting from scratch but I just can’t, at least at the moment. I had help in the binding process as you can see. Mr Tiggy was just invaluable! One thing I learned in this process – and when I was sewing the Which way? quilt top – was that I don’t like the 1/4″ foot on the Bernina. It just feeds the two fabrics so differently. I much prefer sewing with the walking foot. Well here it is. In addition to all the other spiritual symbolism I saw in it, it has reminded me of another important maxim – Perfection belongs only to God. 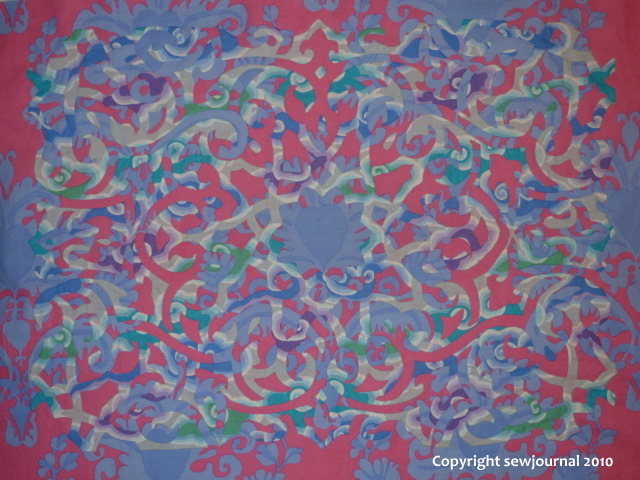 Having basted my Arabesque the other day I set straight into quilting it. It’s coming together nicely and I’m very happy with it so far. I found a tiny nick in the background in one place so I think if I’m going to continue with reverse appliqe then I’ll need to invest in a pair of duckbilled scissors. Has any of you used these? And if so, do you find then helpful? Doing the actual basting was relatively easy. In fact, easier than using safety pins because I didn’t have to do them up. If you have any bent pins though, then save them up for this activity because it would be much easier if the pins weren’t straight. As to quilting with this set up… Hand quilting is not as difficult as it is with safety pins as the pins themselves don’t get tangled when you fold the quilt up but the thread does tend to wrap around the pins which is a pain. In my case that often whips the polystyrene plug off the pin. This may not happen with the Pinmoors because they are denser and larger. 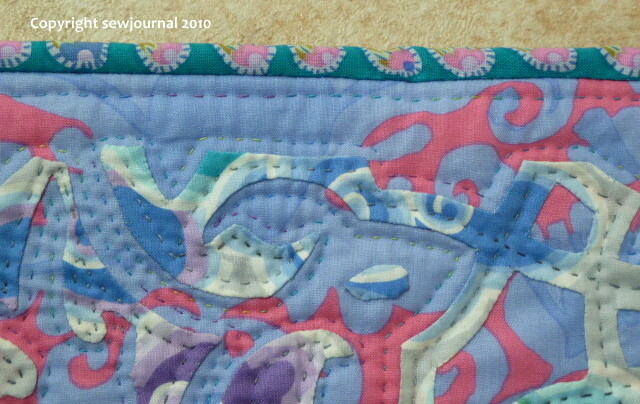 I think you could fix this problem by pinning your quilt upside down and having the backing on top when you pin so that the pins are underneath when you quilt. This would also help for hand quilting with safety pins though it wouldn’t stop the damage they cause. I think Pinmoors would be great for machine quilting because they are more easily removed than safety pins. I think they’d be fine for hand quilting if you pinned the quilt upside down. On my next quilt I’m going to try a variation of the normal thread basting and see how that goes. I’l let you know. 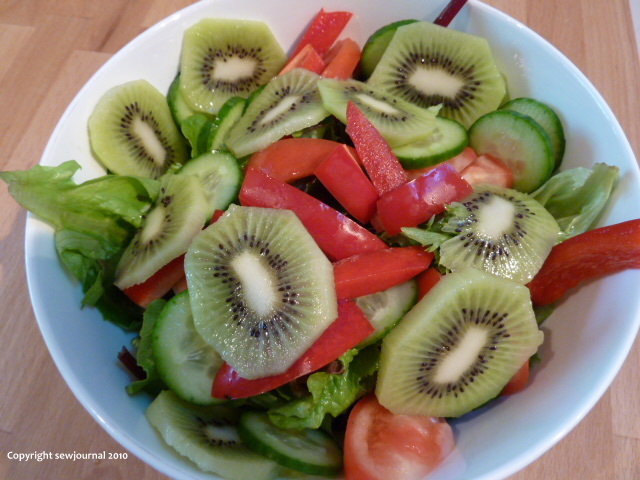 I made a salad last night to go with dinner and added some Kiwifruit. I thought it looked so lovely that I took a photo. What do you reckon? At last! The clouds have parted and the Arabesque has revealed itself. I’ve had reservations about this ever since I started. I knew that it was dangerous to use two busy fabrics like this but I wanted them both to be busy to represent the “busy”ness of the ego and the beauty and luminosity of the Divine Centre. I wrote a bit about the symbolism of this piece here if you haven’t read it before. It’s still hard to see the Arabesque in some parts but I think it’s visible enough. Hopefully when I quilt it with a dark grey multi-hued thread it will become clearer yet still retain that slightly “hard to see” aspect because it is hard to see the Divine Qualities shining through the garishness that is the ego. 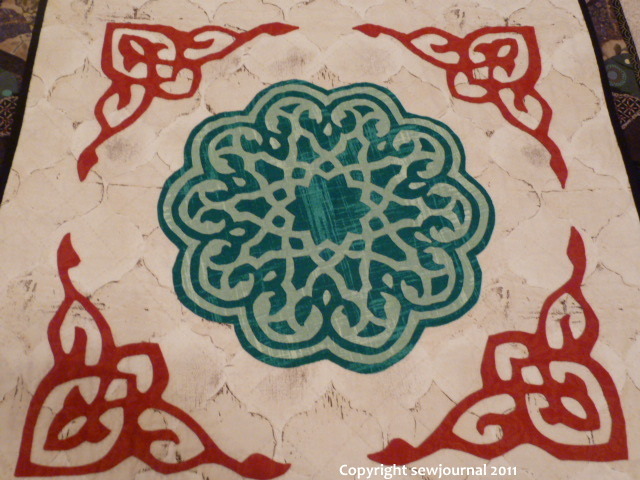 I’ve been doing some thinking about the spiritual symbolism of the second in my series Paths to the Divine Centre – the Arabesque. As I’ve been working on it I have had some realisations which I thought I would share with you. 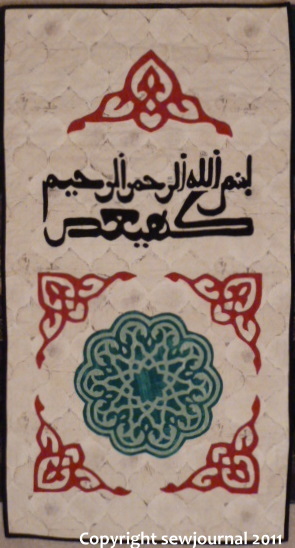 In this piece the bottom fabric represents the beauty and luminosity of the Divine Centre. (This is understood differently in different spiritual traditions. In some it is the Divine Spark in others the polished mirror of the heart which reflects the Divine.) The top fabric represents the ego. To begin with, before cutting away any fabric, all that’s visible is the ego which is beautiful, alluring and easy to become seduced by. Slowly, as bit by bit the top fabric is cut away, the beauty of the “Divine fabric” is made visible. It struck me that this a great metaphor for any authentic spiritual path. That the more the ego is sacrificed to the Divine principle, the more beauty appears and not just because the “Divine” is more visible but because a unity of pattern consisting of both the Divine and the ego appears – the ego in the service of the Divine. Now, a while back I posted a photo and said that I wasn’t sure it was working as it was hard to make out the pattern. 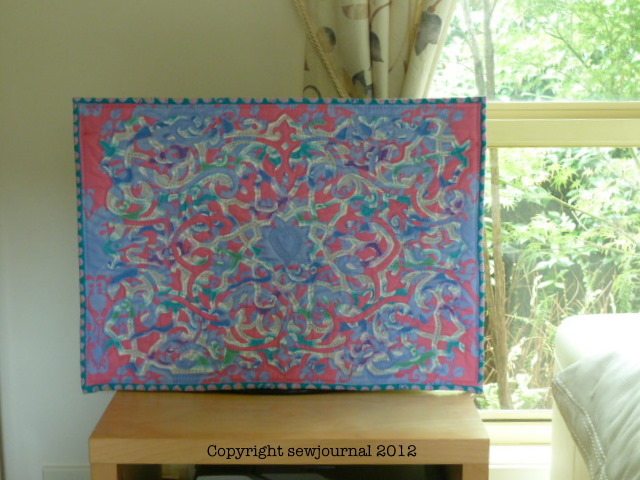 Since then I have done more cutting and as less and less “ego” is visible the beauty of the pattern is appearing. I’m now of the belief that eventually you will be able to see the pattern clearly when more of the “Divine” is visible. I realise that the pattern would have been easier to see if the “ego fabric” had been plain, but egos aren’t plain. They are complex, busy and masquerade as the Divine and I wanted to represent that in this Arabesque. So, while the finished piece may “work” as a piece with the pattern easily discernible, that really is not the point. It is the journey to getting there that is the spiritual metaphor in this work – the subjugation of the ego to the Divine purpose that produces the final beautiful result. Only time will tell if this piece works out but for me the journey has been worthwhile whatever the result.